A study from 2013 that linked champagne with the prevention of Alzheimer’s, went viral on social media this week. With Thanksgiving, Christmas and New Year’s Eve around the corner, we’re in the midst of the holiday season. The holiday season equals family dinners and holiday parties and if you’re really lucky, a few champagne toasts to your good health. If the upcoming festivities hasn’t made you giddy enough, let me draw your attention to a study that has been going viral on the internet which highlights how “drinking to your good health” can be taken more literally than we thought. Drinking champagne prevents memory loss? This week a study that linked drinking one to three glasses of champagne a week with the prevention of Alzheimer’s began trending on social media and gave people another reason to crack open a bottle of champagne. Two years ago, researchers from the University of Reading discovered that specific compounds found in two kinds of grapes – pinot noir and pinot meunier – which are used for making champagne improves the spatial memory. The spatial memory is responsible for recording information about one’s environment and its spatial orientation which typically deteriorates in old age. But before you pop open those bottles of champagne, you should know that the research has only been conducted on rats so far, not on humans. The scientists arrived at this conclusion by observing three groups of eight rats. The rats had to complete a maze at the beginning of the study and again after six weeks of daily champagne intake. Surprisingly, the rats showed a higher success rate after the sixth week, showing that the properties in the bubbly drink may help to combat memory loss. The Alzheimer’s Society released a statement saying that although the results are intriguing, human trials are needed to find out if champagne really could influence the memory and combat Alzheimer’s disease. It’s too early to say what the effect could be on humans. Unfortunately, it may be some time before doctors start prescribing a glass of champagne once or twice a week, so in the meantime, here are a few effective, less expensive and tested measures (that don’t involve a corkscrew) to help improve your memory. Research has found that keeping the brain active seems to increase its vitality and may even build reserves of brain cells and connections. The best brain-boosting exercises are the ones that challenge you and offer novelty. You could drive home via a different route or if you’ve always wanted to learn a new language, there is no better time than the present. Not only does exercise do wonders for your physical appearance, but it also keeps your brain young too. Exercise increases the oxygen to your brain which benefits the brain cells. A recent study of female identical twins found that the sibling with stronger legs had better brain power after ten years than their less fit sibling. So squats, lunges and going for a brisk stroll can help to keep your mind sharp. There is no guarantee that incorporating these measures into your daily life prevent all types of dementia. However, adopting a healthy lifestyle has proven to lower the risk of developing diseases such as heart disease. Though the research in the area of the relationship between diet and the cognitive function of the brain is limited, it does point out that a diet low in fat and high in fruits and vegetables may help in reducing the risk of developing Alzheimer’s. A Mediterranean-style diet is a good example of this. While we still have to wait for researchers to further prove that drinking a glass of bubbly really helps to combat Alzheimer’s, it is still a healthier option than any other alcoholic beverage. 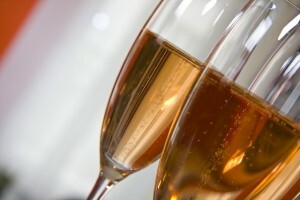 A glass of champagne contains fewer calories per glass than most wines and cocktails. I’ll definitely toast to that.